Weddings are both solemn and joyful occasions – a blend of seriousness and serendipity. Wedding vows reflect the heartfelt commitment a couple makes to each other. After all … a wedding is for a day … a marriage is for a lifetime. At the same time, the most memorable wedding moments are often the surprises. Dallis and I will never forget the collective gasp of our guests when our friend Jim, who was officiating, dropped my ring on the deck where we were standing and it rolled several feet, nearly falling through a crack. We took a brief time-out to retrieve it, and the episode has been a source of fun and laughter ever since. Recently Dallis attended an outdoor wedding at La Purisima Mission in Lompoc, California, founded by the Franciscans in 1787, and now a State Historical Park. It was a beautiful day in a picturesque setting. The ceremony had started a little late and was coming to the place where the bride and groom would be introduced as a married couple. And at that, a VERY loud and quite obnoxious “HEE HAW HEE HAW HEE HAW HEE HAW” came from what seemed like heaven, but in reality was from the corral next to the Mission. Did I mention that livestock are kept in the park? Laughter and smiles broke out! It was a surprise moment that won’t soon be forgotten. Here’s the uninvited wedding guest – doesn’t he looked pleased with himself? I just left a reply to another post on another blog … that I often feel there is a benificent presence in this old world that has a great sense of humor! I have a feeling that’s what poets tap into when they create their literary leaps. Thanks for this post… It’s great! Great post. My brother in law was recently married and their uninvited wedding guest was a train, both at the ceremony and reception. Wow! Now there’s a noisy guest. Hopefully it was brief. At the downtown church I serve located on a main intersection a block from both the Police station and a Fire station, I often compete with sirens (and lose). What a beautifully heart-warming story!! My partner and I are planning a commitment ceremony, and we could only hope to have such an honorable surprise guest!! How fun!! Oh, that is so funny! It’s always a good sign to have a lighthearted moment at a wedding. It is! Lighthearted is a good word for it, allowing people to laugh and relax. Yes, every wedding needs a funny story to tell our grandkids 50 years later – – – or to have the grandkids tell the guests at our anniversary party! For Bob & me, it was having the ringbearer curl up on the top step in the church, and fall asleep during the ceremony. The rehearsal dinner and party the night before had been a bit too much for him! Ah, memories! That donkey will give the couple plenty to bray about for years to come! Thanks for posting, Mark. I love the picture!! Thanks, Jan. A sleeping ringbearer – I don’t think I’ve ever seen that – I’ve seen fidgety ringbearer, distracted ringbearer, hyperactive ringbearer, but never sleeping ringbearer! He is now about 54 and lives/teaches in Thailand. Works with kindergarteners who are about the age he was at that time. Cute as a button – and seldom worn out – we did a number on him the night before the wedding!! 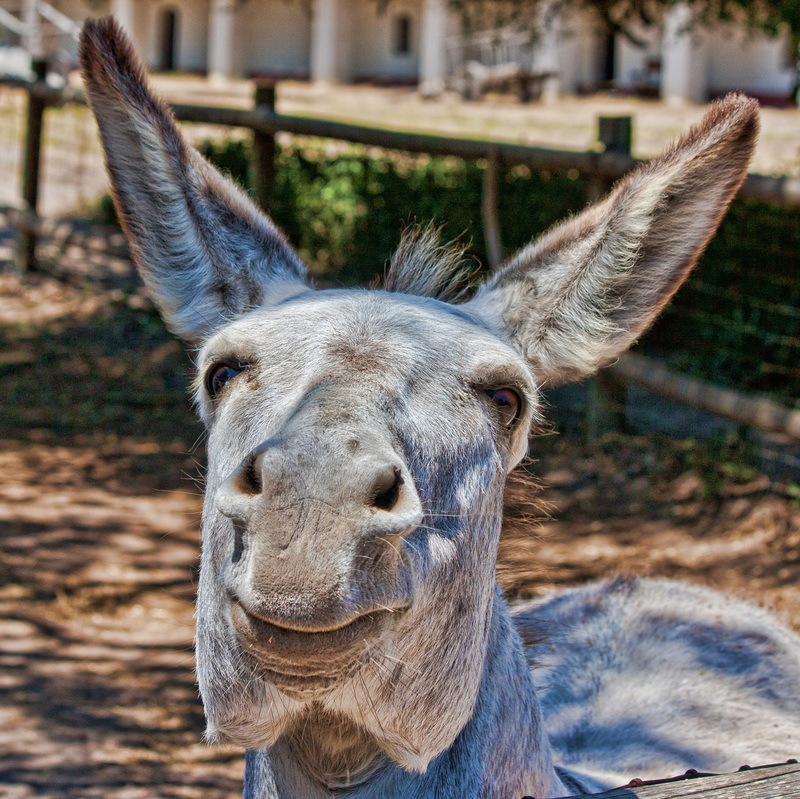 I’ve never seen a better portrait of a donkey! And yes, we humans, donkeys that *we* often are, can benefit not only from moments of serendipity in the midst of our greatest intensity but also from remembering just how joyful being silly and humble can make us. Thanks for a delightful reminder!